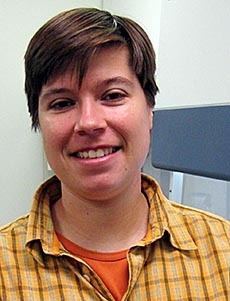 Biologist Helena Soares is a Senior Graduate Student who will graduate this year in Microbial Evolution. She has been working on IdeaConnection challenges since October 2011 and has received an award for one, while others are still being evaluated. In addition to being a problem solver Helena also facilitates a number of challenges. solution might be, or do you always start with a blank sheet of paper? Not what the solution might be, but I already have some ideas about how to get there. I usually start with, "oh, I think we could solve this by looking into this field or taking this approach," and from there at least you know which way you're going to find a solution. What is it about being a solver that appeals to you? In my work and everything I do in life I'm normally a problem solver. If there's a problem, if there's something that's not working, I want to find a solution. So it's something that I already do in my research. But at IdeaConnection it's more towards a specific solution; there's a very specific problem to be solved and it's not an everyday problem. It's not related to my research, but it is a challenge and I do like challenges, especially challenges that are intellectually stimulating. When you're working on these challenges are there parts about the process you like more than others? I think it depends on the challenge. If it's a very applied challenge I enjoy the beginning – doing the research on methodologies for instance. Challenges are more difficult if they’re not directly related to what I do as I have to understand all those methodologies before I can come up with something different. Other challenges that are just literature, search and evaluation, I really like them because I always learn something too. I think the most stressful part of all the challenges I have worked on are towards the end, putting the solutions together into a text that the seeker will look at and understand without having to try to read our minds. How have you found the experience of working with such diverse groups of people? It's lots of fun. You always learn different things, not only about the subject of the challenge, but also about other people's lives and cultures and what they do. So it's a very interesting way to keep in touch with the rest of the world. What prompted your own move into facilitation? I think it's a very important role and important for me. Not only here at IdeaConnection, but also if I want to work in research either in academia or industry. It's good for everyone to know how to work with teams and how to lead those teams towards a goal. I'm using the challenges I participate in not only for IdeaConnection, but also to grow as a professional scientist. What are some of the things that you've learned since you've been a facilitator? I have learned techniques to keep everyone on track, because in academia I think we lack that a bit. I can give you an example. We were working as a team to come up with an evaluation to choose one candidate for a job. I envisioned that meeting lasting the whole day, because we would just go off track as we're all friends and have things to talk about. But I was able to keep everyone on track and focused on the goal. This is our goal for today; we can go and talk about those other things after the meeting if we want. In academia, no one teaches us those human interaction parts so it is very helpful. The things I have learned as a facilitator have helped me to run meetings more efficiently. You have received an award for one of the challenges you worked on. What does it mean to you when such success comes your way? The acknowledgment that our ideas are good and are usable, and are helpful to the seeker, is good. But a monetary award really helps, and in this economy any help is great, it does make a bit of a difference.